Mount Magazine, officially named Magazine Mountain, is the highest point of the U.S. Interior Highlands and the U.S. state of Arkansas, and is the site of Mount Magazine State Park. It is a flat-topped mountain or mesa capped by hard rock and rimmed by precipitous cliffs. There are two summits atop the mountain: Signal Hill, which reaches 2,753 feet (839 m), and Mossback Ridge, which reaches 2,700 ft (823.0 m). Mount Magazine gets its name from French explorers who, while traveling through the area, witnessed a landslide on the mountain. The noise from the landslide was so great that one explorer described it as the sound of an ammunition magazine exploding, hence the name "Magazine". The U.S. Geological Survey's Geographic Names Information System (GNIS) indicates that the official name of this landform is "Magazine Mountain", not "Mount Magazine". Generally "Mount [Name]" is used for peaks and "[Name] Mountain" is used for ridges, which better describes this landform. Mount Magazine appears in the GNIS as a ridge with Signal Hill as its summit. "Mount Magazine" is the name used by the Arkansas Department of Parks and Tourism, which follows what the locals have used since the area was first settled. Mount Magazine is often called "the highest point between the Alleghenies and the Rockies", but there are many parts of Texas, Oklahoma, Kansas, Nebraska, South Dakota, and North Dakota with higher elevations. Mount Magazine is located due north of Blue Mountain Lake in Logan County, Arkansas, approximately 45 mi (72 km) east of the Arkansas-Oklahoma border. The most scenic route to the top is a 10 mi (16 km) drive along Highway 309 (also known as the Mount Magazine Scenic Byway) from Havana. 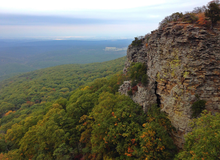 Many consider Mount Magazine to be part of the Ouachita Mountains, though it is really part of the Arkansas River Valley. It lies within a southern extension of the Ozark National Forest despite being much closer to the Ouachita National Forest. As the South American plate collided with the North American plate during the late Paleozoic, a major foreland basin, the Arkoma Basin, developed north of the Ouachita Mountains. Small grains of sediment that had filled the Arkoma Basin were compacted and cemented into sedimentary rock. As the land rose above sea level, small streams developed that eventually merged into the Arkansas River. After millions of years of erosion, synclines like Mount Magazine have become the most positive topographic features; this phenomenon is the result of the rapid weathering of shales once sandstones were breached on the flanks of surrounding anticlines. Mount Magazine is a broad mesa composed of Pennsylvanian sedimentary rocks deposited in various shallow-water environments. Like many mountains in the western Arkansas River Valley, Mount Magazine is capped by the Savanna Formation, a sequence of shale, siltstone, and sandstone; the upper portion of this sequence is missing throughout most of Arkansas. The Savanna Formation is conformable with the underlying McAlester Formation, a sequence of shale, siltstone, sandstone, and a number of coal beds. The McAlester Formation is conformable with the underlying Hartshorne Sandstone, a prominent ledge-former under favorable structural conditions. The Hartshorne Sandstone is unconformable with the underlying Atoka Formation. This unit has the largest areal extent of any of the Paleozoic formations in Arkansas, extending as far north as the Boston Mountains, and is divided into upper, middle, and lower members. ^ a b "MAG". NGS data sheet. U.S. National Geodetic Survey. Retrieved 2008-12-16. ^ "Magazine Mountain, Arkansas". Peakbagger.com. Retrieved 2012-10-17. ^ "Mount Magazine State Park". Arkansas Department of Parks and Tourism. Retrieved 2013-01-02. ^ "Magazine Mountain". Geographic Names Information System. United States Geological Survey. Retrieved 2013-01-02. ^ "Signal Hill". Geographic Names Information System. United States Geological Survey. Retrieved 2013-01-02. ^ "Arkansas's Highpoint Information" (PDF). Arkansas Department of Parks and Tourism. Retrieved 2013-01-02. ^ a b "Geologic Map of Arkansas" (PDF). Arkansas Geological Survey. Retrieved 2017-10-22. ^ "Western Regional Climate Center". Retrieved 2016-08-12. ^ a b Morris, R.C. (1974). "Sedimentary and Tectonic History of the Ouachita Mountains". The Society of Economic Paleontologists and Mineralogists Special Publications. 22. ^ "The Geologic History of Mount Magazine" (pdf). Arkansas Department of Parks and Tourism. Retrieved 2017-10-24. ^ "Stratigraphic Summary of the Arkansas River Valley and Ouachita Mountains" (website). Arkansas Geological Survey. Retrieved 2017-10-26. ^ a b c d e "Geologic Map of Mount Magazine State Park and Vicinity" (PDF). Arkansas Geological Survey. Retrieved 2017-10-22.